First up, for all of you who noticed I had vanished off the blog planet without a trace, I apologise for not giving you a heads up. I have been overseas in Dubai for the past 3 weeks indulging in a much overdue and needed holiday with family and friends. I absolutely enjoyed every moment spent with my loved ones. I happened to also spend my birthday there and my hubby treated me with an experience of a life time. 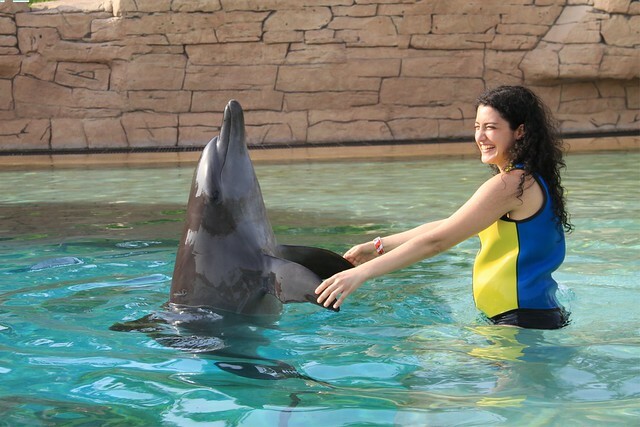 I got to indulge with a dolphin encounter at Atlantis. It cost a fortune but it was worth every cent. I was blown away with the very well set up dolphin program. We commonly assume dolphins blow water out of their blowhole. That is incorrect, they can only blow air out of it. The water that appears to come out of their blowholes is simply water that has accumulated on the surface surrounding the blowhole and been blasted with the air pressure. Dolphins can control their breathing and must deliberately surface and open their blowholes to get air. Dolphins all have unique fins that make them quite distinguishable from each other. Alejandro then thoroughly discussed exactly how we will be working with the dolphins and divided us into different groups. 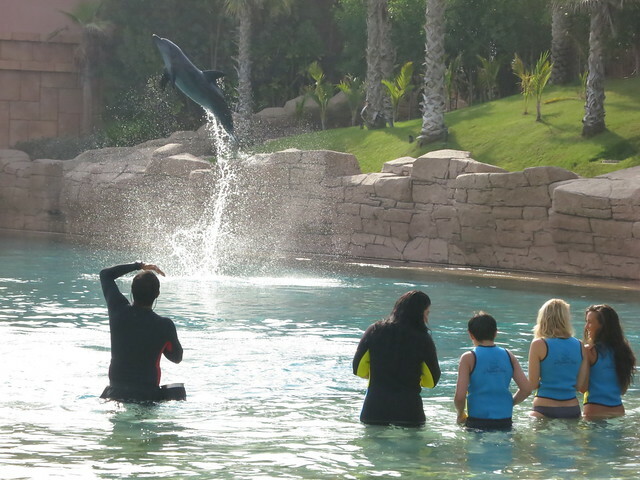 They only use positive reinforcement strategies in training all the dolphins. My dolphin was named ‘Central’ and she was a 6 year old Bottlenose dolphin. 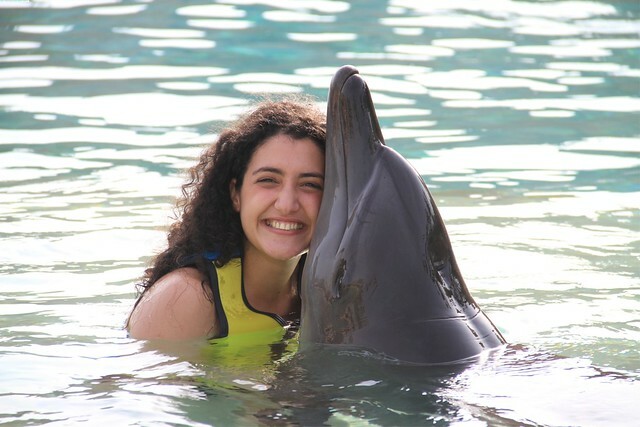 This wasn’t the first time I have met a dolphin. 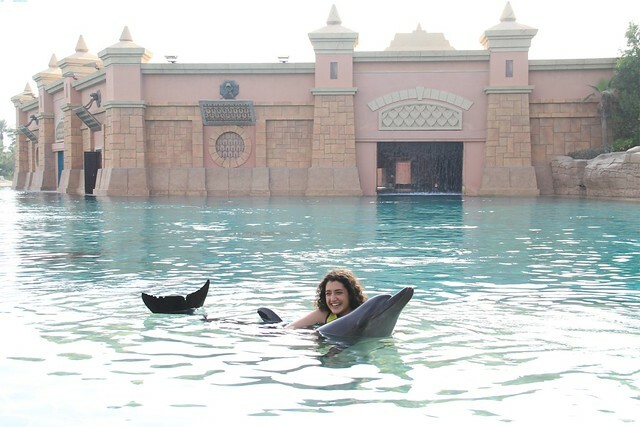 I was lucky to be randomly picked out of a group at Sentosa beach in Singapore 5-6 years ago to pat a pink dolphin. 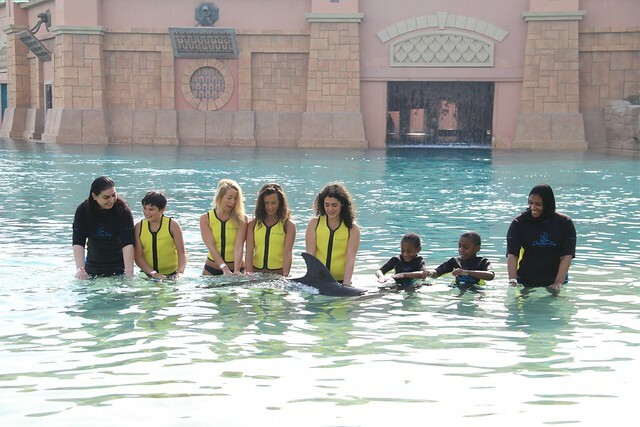 I don’t recall too much information being provided about the dolphins and I wasn’t given any real training tips prior to touching it. I simply recall being taken aback by the sheer size of the pink dolphin. However, it was disappointing that I didn’t gain any information about them from that experience. As for my current experience, I came away learning so much more about dolphins. Our group consisted of 8 people (5 adults & 3 young children) and 2 trainers were assigned to each group. We were given very detailed instructions which we all followed very carefully. For starters, we all had to put our hands out for ‘Central’ to come and meet us. She gently approached us and allowed us to pat her. Needless to say, we had a very intimate moment. My husband actually felt a pinch of jealousy watching us share our first kiss. 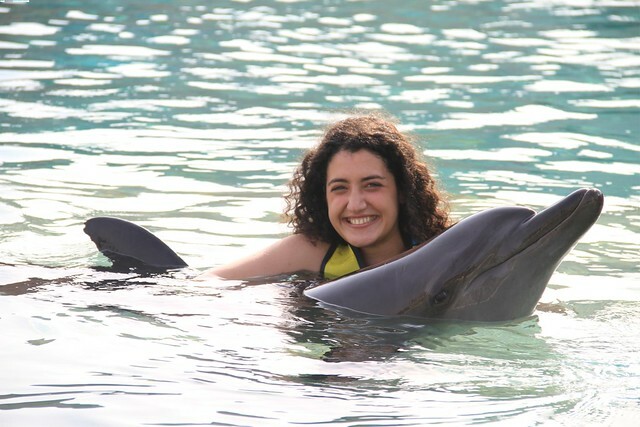 I mean how often can you say, you snuggled up to a dolphin?!? I was even instructed to splash ‘Central’ and she fought back. I even got to dance with ‘Central’. ‘Central’ bid us farewell while showing off her agility skills. ‘Central’ was so beautiful and responded instantly to her commands. There was only one incident whereby one of the group members didn’t appropriately implement the command to dance with her & ‘Central’ turned away and left her. I was quite impressed with her high level of training and her ability to allow so many different people of variable ages to get so close to her. I was yelling out ‘Good girl’ and smiling ear to ear during the whole event. 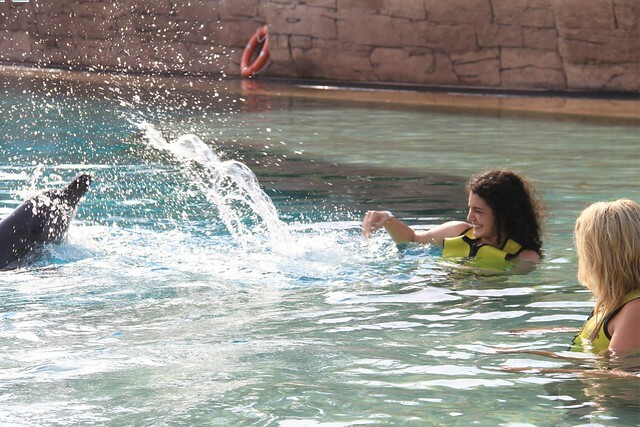 I think the above pictures clearly reflects the exquisite nature of my dolphin encounter. I left Dubai with a heavy heart because I had to say goodbye to my family and closest friends. I won’t be seeing most of them for another year or so. On the bright side, I feel well rejuvenated and am happy to be back amongst my colleagues and Aussie mates and most importantly my fur babies and patients. We are moving into our much anticipated purpose-built new clinic in the next month, so that’s pretty exciting! I have compiled many interesting cases and can’t wait to share them with you over the next few weeks. Are you ready for all these mind boggling cases? ← Do you trust your vet? Very cool! I have always felt a bit embarrassed to say that dolphins are my favorite animals, because it seems kind of girly. Still, I must admit that it is true, and I hope I’ll have the opportunity to work more closely with them again sometime in the future. Dr Rayya from your website it appears clear that you have a genuine love of animals. Could you do me a favour and watch a documentary called ‘the Cove”. Its about the taichi dolphin slaughters in Japan. I hope it may change your opinion on Dolphins in captivity. I will definitely watch the documentary you mentioned and get back to you with my thoughts on it. Hey Sammy. Glad my passion for animals is clearly illustrated. I am not a fan of wild animals being kept in captivity. I will make sure to watch the documentary and learn more about the plight of dolphins. Can’t wait – I’ve missed your posts & even double-checked last week that I hadn’t somehow lost my link with your wonderful blog. These pics are awesome and awe-inspiring. For a regular person to be able to have this experience would have been great, but for a true animal person, it must have been one of the highlights of your young life…may it be one of many such moments in the years to come. Bless you for your genuine unabashed love of animals. The Red Man salutes you and gives you paw snaps! I have missed you, but I am glad you had such a fantastic excuse for being away! I am so ready for your crazy cases! I thin one of the photos of you with her needs to go on your wall at the clinic! Glad to hear from you again. Wow Rayya – how lucky can you get! 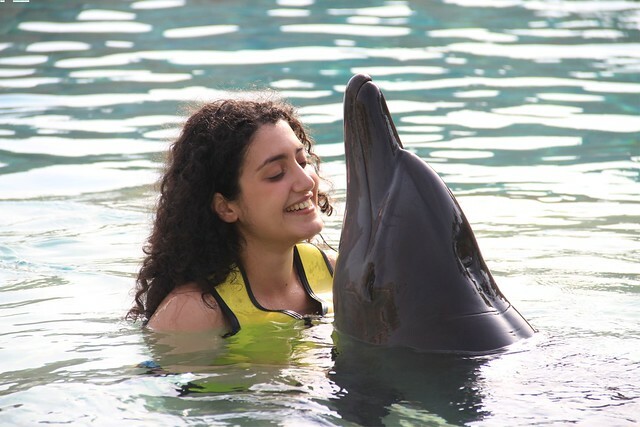 What a fabulous chance to meet a dolfin who’ll let you get close and to dance with her. Incredibly special. As usual, we’re dying to catch up with your latest cases and meet your lovely patients. Wow what a beautiful experience! I have always wanted to do that but the closest I have ever gotten is at SeaWorld 😉 However I did get to see Dolphins swimming in front of the ship when I went on a cruise years ago that was quite spectacular. They are such beautiful and graceful creatures! That’s a great story. I love the photos! 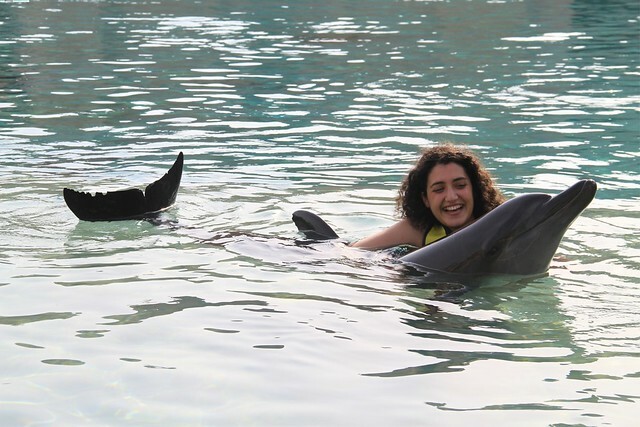 I never knew dolphins would snuggle with people! What a perfect way to start my day, getting to share this marvelous experience with you. You simply look like you’re in seventh heaven with Central. No wonder your husband was jealous. Hi Rayya! 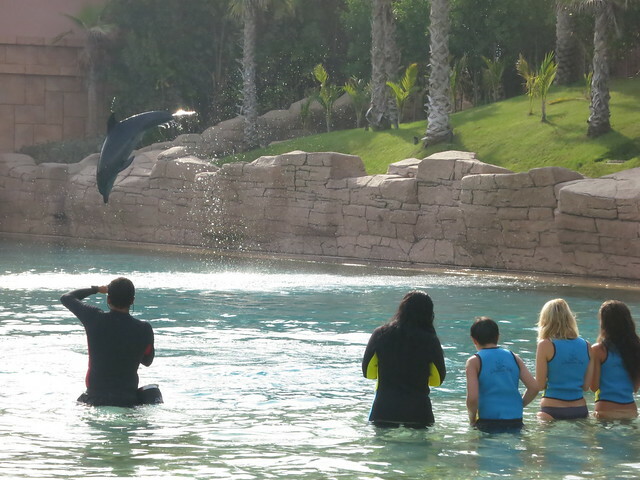 Nice to have you back with us again, I missed you, but glad you had such a good time with family and friends in Dubai – and got to spend some quality time with the dolphins at Atlantis. The photos tell the story for us – they are awesome, and I know this is an experience that will stay with you forever. 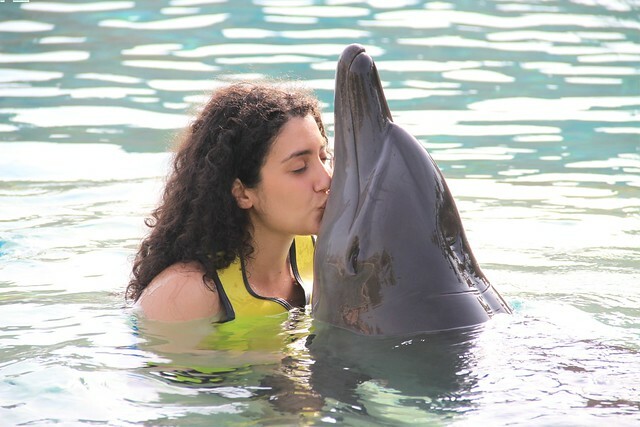 The dolphins are incredibly intelligent and obviously love socializing with humans. Thanks for sharing your experience with us. I am looking forward to your next posts! Hey Barb. I’ve missed you too. I’m thankful for facebook as it has kept me up to date on your news. I can’t wait to read all the blogs you’ve written that I’ve missed. Wow Rayya – sounds as though you have had a fantastic & well earned break. 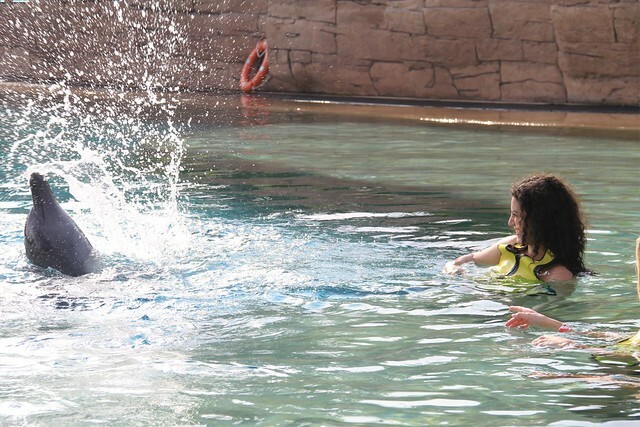 Loved sharing your dolphin experience. Welcome back. What a wonderful, unforgettable experience – and I love the photos! Happy Birthday! Great pictures of dolphins. Thanks Bassa :-). Can’t wait to catch up on all your news. Ready! And BLOWN AWAY by the beauty of you and the awesome Central. Looks like the experience of a lifetime. And sorry about your sadness in parting. Sweet sorrow. Thanks so much nadbugs :-). Goodbyes are always bitter sweet but I’ve settled back at home and so happy to be surrounded with my patients again. Glad you are ready for my very exciting future blogs. Glad to have you back Dr. Rayya, I thought you were just busy but you were having a well-deserved vacation!! Can’t wait to hear about the new building and all your interesting cases. 🙂 and love the pictures of you and Central! What a delightful post and so happy for you. Your face radiates contentment and happiness in the photos. Glad you had a nice vacation with family and friends but yes it is hard to be so far away. Your post was a great way to start my day. Thanks for sharing. I have a big smile on my face just from looking at these photos, Rayya. Thanks for sharing an incredible experience. Thanks Jaynee. It was a must share experience & I’m thrilled you enjoyed reading about it. Dr Raaya, I truly hope you do watch “the cove”, I equally hope you do some research into life expectancy and health related issues of Dolphins in captivity. 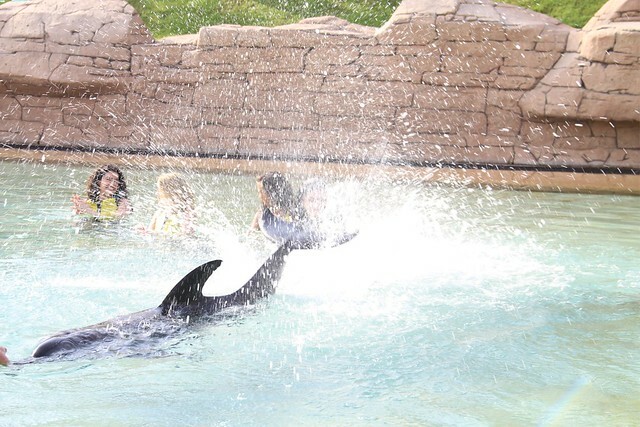 I also hope that in future instead of patronizing any dolphin water parks, you spend as much time as possible dissuading as many people as you can from attending them. I live by the beach and have been blessed on a few occasions to have had dolphins pass me whilst I was swimming. I would have paid hundreds of dollars for the experience of swimming near these magnificent animals, yet you would literally have to put a gun to my head to get me to set foot inside any establishment that keeps them in captivity. I know this comment may sound a bit antagonistic and it truly isn’t meant to be. I just feel that as educated as you maybe be, you too have fallen for the same trap that so many people have fallen for: and that is just because the dolphin has a permanent smile and does lots of nice tricks doesn’t mean its happy in captivity. And considering the cognitive abilities of these animals, captivity becomes all the more barbaric.